Right back in my early days of writing here I wrote a post called “Aims, topics, and breaking your own rules”. One of the topics I said I would cover was my route to professional qualification. I reckon it’s time we took a break from responsibilities in connection design and introduced another theme. Streamline my commitments (I gave up being a School Governor amongst other things). Streamline my waistline (I took up running). Streamline the amount of stuff I need, keep or use. This year’s theme will use the time and discipline I’ve gained from last year and allow me to Get Things Done, and one of those Things I want to Get Done is to make a significant step forward in my route to becoming a Chartered Engineer. You mean you aren’t Chartered yet? What have you been doing with yourself? You’ve told me you’ve been doing this for ten years you lazy monkey! I don’t want to lay this out as “Martyn’s excuses for not doing his homework” however I do feel strongly that the deck is stacked against engineers working exclusively in fabrication who started their careers around the financial crash of 2007. To paraphrase an old friend from school “I prefer the team reasons or explanation of events to excuses”. Let’s explain those … events. When I was a graduate at a fabricator in 2006/7, things were actually peachy. There were multiple Chartered Engineers of regard within our organisation and we had a solid graduate training plan. The business itself was created by engineers, and run by engineers. Come the crash however, the first thing to go was training. No longer could Wednesday afternoons be spent in the meeting room doing CPD, as every man was straining to keep the business afloat. As it happened, I left that business some months before it failed, and subsequently after a year of working for a small consultancy found myself back with my old team leader - let’s call him Chris, because ... that’s his name - at another fabricator (where I’ve been for 8 years now). This time around, we were it. Chris and I were the entire design department. The business we entered had previously done no more than 1 Design & Build project per year up to this point, and we were to take that up to 5 or 6 per year between the pair of us with immediate effect. It would be unfair to suggest that we somehow resented this new independence, in fact we both thrived on it, but the lack of available mentors was tough. Who would sign off our quarterly reports? Nobody that we knew, and would we even have time to do them given that we had a voracious fab shop to feed? As it turns out, this was a good time for rapid on-the-job learning that would serve us both well, gaining bags of practical commercial experience and cranking out calculations to keep the fab shop fed, but it was not a great time for Chartership progress. To cut a long story short, moving into a business that isn’t run by engineers or have established senior engineers in place isn’t a great place to be for professional mentoring. Don’t get me wrong - it was superb for many other reasons, and given the same choices again, I’d still be exactly where I am now. Over those 8 years, I suppose I have become one of those experienced engineers we didn’t have when I started, and I hope that my legacy in the company will be of finding new talent to replace myself, and putting in the systems to allow that to keep on happening. Time will tell. There is a good deal to be said for specialism, especially from my personal experience. It’s brought me to where I am and I am grateful. It has not exactly been an especially useful route to Chartership though, it must be said. I have spent an entire career minus one year working in businesses where the only material I am required to design is steel. The year I did spend in consultancy I hoped would gave me an opportunity to spread my wings a little. It would however turn out that the forces of business decreed that my previous experience in fabrication meant that I was given all the steelwork gigs that came in that year, and opportunities to master the other common construction materials were limited. If I’d stuck it out, maybe things would have evened out over time. I will never know. Could I have recognised a lack of professional progress in fabrication and changed jobs to further my development? In theory I could have, but in practice not so much. I had already taken a large pay cut to move into consulting for that one year (owing mostly to my specialism), but then came the family. I primarily moved back to fabrication for the money, as I now had a tiny mouth to feed and would likely need to move house. I could make the years I’d spent previously in fabrication count for me rather than against. The timing was fortuitous - I hadn’t planned to move out of consulting, but it was Chris that came knocking just as my wife was 9 months pregnant with our son. Back to specialism I went. So fast forward 8 years and now I have reached an age and position where another move back to a consultancy would bring such a large pay cut as to be effectively financial ruinous. I have to forge a path forward from the chair in which I sit, and I have to be the one to make it work. Complete 13 Core Objective Final Reports. Compile two hard copy portfolios of my work, referenced to those Core Objectives. Find 2 existing Chartered Members who will sign my application form, having seen my work and agreeing that I have reached the required standard for Professional Review. Find a Fellow of the IstructE to do the same. Note: my first attempt at contacting a previous lecturer resulted in flat refusal to even consider such a thing. This step truly worries me, owing to my relative insulation from the wider profession. Attend and pass an interview which is designed to find the gaps in my knowledge of which my specialism creates many. In phase two of the Year of Getting Things Done I must do something about these gaps. Pass the final written exam. Strangely, this step is the one which many of my peers felt would be the toughest. Perhaps unwisely, I believe that if I can get to the test, I’ll be very much ready for it. Yikes. Probably best to break this down into more manageable chunks. Getting the 13 final reports written, and my portfolio put together. This will satisfy my first two goals and identity any areas that require consolidation. Making some connections in the wider engineering community, via this website, social media, and attending more IStructE events to give me a fighting chance of not being stumped by requiring signatures from Chartered Members and a Fellow who don’t know me well. I’m hoping that making connections can mostly look after itself without dedicating too much specific time to. That leaves the IPD forms and the portfolio. If I want to be ready to submit by the beginning of September, that leaves seven-ish months. In round terms, that’s 28 weeks to complete 13 forms and create a portfolio. One a fortnight would be cutting it too fine, so that means I need to try to plan which reports I will have no more than a week to get done, and which I can or should take more time over. I’d like to have the reports written by week 20, giving me something like 2 months to finalise the portfolio and garner some signatures. I think the best way to stay accountable here is to draw up the plan, and post my draft reports here as I do them. It is time for the excuses to end, and time to Get Things Done. Turns out I’m a fickle beast. I spend 1000 or so words singing the praises of Procreate after their update last year, and here I am now re-enraptured by Linea Sketch by iconfactory. The main reason I went looking for other sketching apps after spending lots of time with Linea Sketch 2.0 was the lack of a fill tool. The primary reason I’m now back on the Linea bandwagon is the introduction of … a fill tool! But there’s way more to this update for engineering sketching than just a simple fill tool, so let’s take a look at the shiny new features. Before version 2.5 this would have taken me a couple of minutes to do to my satisfaction. The version in the video took 18 seconds. As well as squares and rectangles, Linea 2.5 recognises circles, ellipses, triangles, and finally irregular polygons; the latter being what it falls back on when it cannot reconcile your doodling to a regular polygon. Combined with a select tool which can filter by layer you’ve got a very simple to use but very powerful method of creating a good looking line drawing. This fill tool though, oh this fill tool. What I love about iconfactory is the way they put in so much thought into their very few tools. It’s like going to a new cafe or restaurant and noticing with pleasure that the menu is small. You know that care has been taken to ensure that although your options are somewhat limited, whatever you do have will be excellent. The fill tool has two modes: tap to fill, and freehand. The freehand method is, as far as I can tell, broadly same as that in Paper by 53 (another great sketching app, but more free-hand and watercolour based). You select a colour, whether or not you desire transparency, then you draw a shape. The resulting shape is converted to a block of colour with no outline. Tap to fill is where the real action is at though. The way icon factory have configured it is just genius. It works like the old paint bucket tool in MS Paint, but cleverly with your layers and even guidelines. The fill tool essentially reacts to whatever is on the screen, and ignores whatever is turned off. The fill is made on the currently selected layer, regardless of which layer the detected boundaries are on. My usual workflow is to do everything first in blue pencil on my bottom layer with the small 4x4 guidelines switched on, then when I’m happy I ink over that on the topmost layer. When the inks are finished, I use the middle three layers for colours, centrelines and labels. All I need to do to throw in my colours is turn off my pencil layer, centrelines and the guidelines to show just my final ink outlines, select my colours and tap away. Super fast, super obvious, and incredibly helpful. Ever since seeing Glen Cooper’s (@AvatarEngineers on twitter) vibrant hand calcs done on an iPad 4 or 5 years ago, I’ve endeavoured to get some colour into my sketches because it just brings them out beautifully. The issue has always been time - colour used to take time away from the calcs, and was only something I could afford to do when it was really necessary; now it’s such a quick job it’s crazy not to colour my sketches. I’m just throwing in a mention for these two new features for completeness, as I’ve not had any real interaction with them. Blending is something I almost certainly will not be using in my day job, but I expect the support for reverting drawings to a previous state will be very useful in the future. Linea Sketch 2.5 is all sorts of my jam. If you are an engineer doing hand calcs on your iPad, you ought to be using this. It’s just the best. Boring myself: or let’s make this snappier. You know what? Over the last few weeks I have written 1500 words about pinned connections and did a boatload of sketches to go with them, but every time I came back to do an edit pass I was bored. I’m not trying to write a dry textbook; I’m trying to write about my industry with enthusiasm and, one would hope, a little insight. I reckon it’s time to kill this particular darling and just pull out the few interesting bits that were peppered in with the dross. Starting today I’m going to try to bash out a short little snippet every day or so to get this thing back rolling again. If you were to take a look at my iPad when I’m working I can safely estimate a 90% chance you’d see it running GoodNotes. Everything I would have previously done on paper, is now done on my iPad Pro 12.9” via GoodNotes with the Apple Pencil. Note: clicking on an image in the gallery moves to the next image. GoodNotes is at its core a vector based PDF markup tool with a small but near perfect box of tools. The most notable feature is the very best digital handwriting inking engine I’ve seen on iOS - and I have tried a lot of handwriting apps. The talented people who made and maintain GoodNotes market it heavily to students as a note-taking tool, and with good reason - it is truly wonderful for note-taking. The great news for engineers is that the features included and the design decisions made for GoodNotes make it an incredible paper replacement for the practicing structural engineer. Before we talk about why GoodNotes is great for engineers, let’s cover the basics: Any handwriting app worthy of notice should feel great to write on, and produce handwriting that is unmistakably that of the writer. GoodNotes does this splendidly. The act of writing feels natural, and the results, at least to my eye, are perfect. Also notable: the palm rejection with the Apple Pencil is great. The pen tool can be switched from a fountain pen feel to a ball-point pen feel, and there are 15 preset colours to choose from. You have the option of expanding your default palette from a grid of 150-odd more, or the freedom to feed it hex codes for any colour you wish. There are 4 preset stroke widths to pick with, but they can also be adjusted with a custom slider. I’ve tweaked my stroke widths slightly and added two shades of green to my palette, but otherwise tend to stick to the defaults. My go-to colours in the fountain pen are the default deep blue, and a teal that I took from the expanded colour picker. The highlighter tool has the same colour and stroke width customisability, and the transparency allows you to layer colours up too, should that take your fancy. Import PDFs as templates into the app’s library. This is where I keep a copy of our company’s calc paper. New page creation is an absolute doddle when you are working too. To create a new blank page, you simply swipe past your final page and GoodNotes will insert a new page using the template you’re currently working on. Import PDFs as standalone documents (from Dropbox or similar), or import them as new pages in an existing document. Want to import a set of architect’s drawings? No problem - you can decide either to import them as individual files (which you can view in separate tabs), or you can import them a single batch so each drawing is in one multi-page document with each drawing on a separate page. Draw straight lines and a few basic shapes with either the pen tool or the highlighter tool with a toggle. This is extremely useful for doing small sketches within your calcs, or neat dimension lines or leaders. Use a lasso tool to select and move or copy any marks you’ve made. This is very helpful for sketches, and little things like copying titles across calc pages as well as just making everything line up nicely after you’ve done it. The lasso can be toggled to select any or all of handwriting marks, imported images, and text boxes. This is such a useful touch - if you’ve imported a snapshot of a drawing or design model and marked it up you can still tweak your marks without also moving the import underneath. Search within your notes for text including your handwritten notes. The OCR is pretty damn accurate. Insert images and text, rearrange your pages and all the other myriad basics you’d expect. Especially handy is support for transparent PNG files, which allows seamless import of more complex sketches done in other apps. Switch the eraser tool from traditional to erase entire stroke. This is incredibly useful for correcting dense calcs. Also very handy if you want to draw some guidelines for writing, then erase them after. iCloud sync means that everything on my iPad is also available on my phone. I personally don’t use the phone version for creating anything, but having access to absolutely everything I’ve ever written all of the time in my pocket has saved me on a good few occasions. Selected items cannot be scaled or rotated. This is a feature available in GoodNotes’ closest competitor, Notability, and I suspect is one the developers are actively working on. Whilst realising GoodNotes is a handwriting app first and foremost, the limitations placed on sketching are sometimes a drawback. For example, the straight line detection will snap lines drawn at shallow angles to be horizontal. A ruler tool like the one included in the Apple Notes app would be wonderful. Better yet if it could at least report the angle to the horizontal and better still if the user could define an angle to set it at. If I’m being really cheeky, a straight up copy of Adobe Sketch’s French Curve tool would be lovely. GoodNotes lacks a fill tool. A good deal of my time when sketching in GoodNotes is spent oh-so-carefully trying to use a highlighter with a circular tip filling in shapes with defined square edges without going over the lines OR taking the pencil off the screen. If you do either you have to start again if you want a neat block of uniform colour. Bookmarks added to GoodNotes do not export back out to PDF. I believe this is also on the to-do list of the developers though. Really getting nitpicky now: the default action when importing multiple items is to import them all as separate documents within GoodNotes. Getting them into a single document is a manual if fairly quick and simple process, but it would be lovely if the app were to ask if you want one document or multiple at point of import. 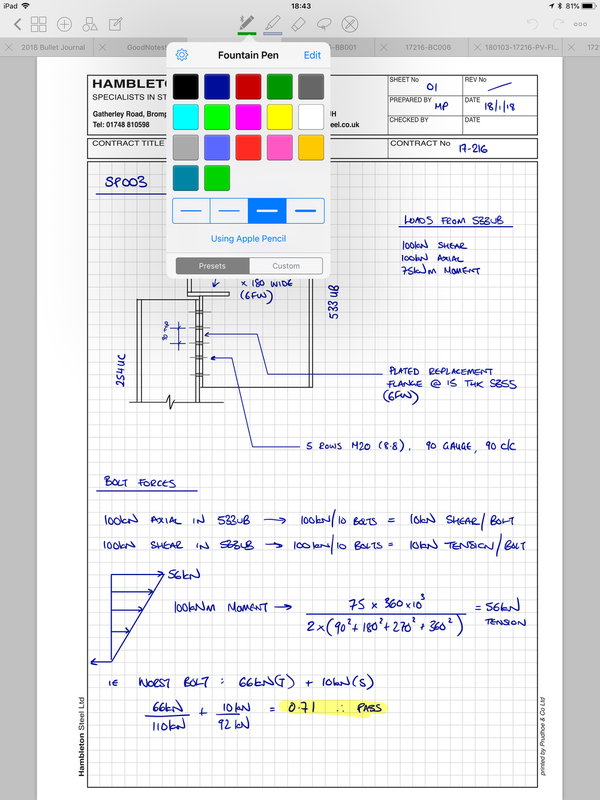 For the practicing engineer GoodNotes has almost everything you need to replace paper. Since getting my iPad Pro and GoodNotes about a 2 years ago I have not used a single sheet of calc paper. I still hop out of GoodNotes to create complex sketches in either Linea Sketch or Paper by 53 depending on the style I’m going for. Both of these apps are able to export transparent PNGs to import back into GoodNotes, blending them seamlessly into your calcs. Given that GoodNotes is primarily a note-taking app, I can absolutely forgive it for not catering to my entire fantasy wishlist of features, and declare it truly and honestly to be the number one app on my iPad, head and shoulders above everything else. One of my key aims writing for this site is to try to explain what makes the role of a consultant engineer different to that of one at a fabricator. To get at this we must first look at how the two types of company operate. There is a single question which allows us to get quickly to the heart of the matter: how does each type of business make their money? The key deliverable, the thing that you pay your money to a Consultant Engineer for, is information. You pay them for expertise, and they provide you with drawings, reports, specifications, letters, statements and expert advice. This information is then turned over to other professionals who may use it to construct a building or other type of structure. The key deliverable of a steelwork fabricator is, unsurprisingly, fabricated steel. A client approaches you with the requirement of having the structural steel frame of a building erected where it is desired, when it is desired, and your job as a fabricator is to provide this, for a price. But from an engineer’s point of view, here is where it gets interesting. It is interesting because a client will approach you with a set of drawings already provided by a consultant engineer showing by and large, a completed design. A small team of consultants may have worked for months, sometimes years on a scheme design, represented in, for example, 30 or 40 drawings but it is presented to us as an opportunity to do what we do best: to take those drawings and try to come up with something better as an alternative. And let’s be honest, what that really means, is to come up with something cheaper. Before we go down that particular rabbit hole, it is only right that I explain a little about the two broad routes a contract in this business can go down. The typical mix of the two types of contract vary over time depending on the economy, and the types of work in the market, but it’s near enough 50/50 for the purposes of this series. Fabricators call these “Engineered” contracts. In a traditional contract, the Consultant Engineer retains all design responsibility apart from connection design - more on that later. Those 30 or 40 drawings I mentioned above form the basis of the contract, and the fabricator is engaged to supply the steelwork shown on those drawings to the client; fabricated, connected and erected. Assess whether or not there are any changes that can be foreseeably made to a scheme to generate any savings significant enough to warrant doing the work in the first place. Assuming a route to cost savings has been established, effectively redesign the whole building, whilst not deviating radically from what the architect expects. Our new, cheaper structure will still have to fit into the zones pre-established by the architect. Price up the work, including the costs of (to name but a few items) running one or more factories, office overheads, materials, fabrication labour, profit. Prepare and submit a detailed quote, giving sufficient information to give confidence to the client that we have not missed out any vital details, but hopefully vague enough to stop our design being easily copied by a rival should the client want to pass our quote around to get a better price. Be prepared to chase the work, via phone calls, emails and meetings to do their best to satisfy any queries the client has, whilst making sure the quote is revised to reflect any changes brought to light since first submission. You can see that an engineer working on winning Design and Build work at a fabricator is required to fill two major roles, and juggle a minor third one. The major roles are that of engineer and estimator. The minor is a sales role. We are typically juggling two or three of these roles at any given time, and to pull back the curtain slightly I also have a managerial role, and a somewhat accidental role as IT triage support. Working at a fabricator is an exercise in furious, existential plate spinning. It is however, very, very rewarding. To finish - If you have been reading closely, you may have spotted me gloss over something that you might question thus: if it took a small team of consultants many months to design something in the first place, how then can one person replicate something similar in just a few weeks? Next topic: time, deadlines, and fitting it all in. Aims, topics, and breaking your own rules. I currently intend to keep my articles here within at least a recongisable orbit of structural engineering, and my relationship with it. I also intend to limit the number of articles aimed specifically at engineers to something like every third piece. When I do write technical articles, I will still do my best to make them understandable to anyone willing to take the time to read them. I must confess, many professionals in the construction industry are guilty of breaking all of these rules a good deal of the time. What is accepted as a "professional" writing style is often just poor writing: it is usually flabby, overwrought, and pompous. I also intend to abuse the sixth rule not only with regard to my writing style, but also my content. I will definitely write about topics outside the world of structural engineering. But for now, I implore anyone reading this to go and read Orwell's essay if you haven't already. It's not very long, freely available, and eye-opening. I’ve been doing the same thing, more or less, for a decade now. When someone is kind enough to ask me what I do for a living, the range of answers I give start around the vague, innacurate, but easily digestable “I sort of design buildings”. I am a Structural Engineer, but not as you probably know them, if you already have an idea of what one is. If a person has an idea of what a Structural Engineer is, the image they would likely have in their mind would reflect a Consultant Structural Engineer; someone who works across projects in many fields. They might come to your house to advise you about a domestic extension, or do high level design of an office building, or design bridges. They would work across multiple materials; reinforced concrete, timber, steelwork, masonry or even more esoteric materials like structural glass. Quite by accdent, I sidestepped this life in favour of specialisation. Shortly after completing my degree I found myself working almost exclusively in structural steelwork, starting with a two-year stint at a now defunct structural steelwork fabricator in West Yorkshire specialising in Design and Build. This is where my journey into specialisation began. In the run-up to its collapse (see: Global Financial Crisis of 2007-8), I was offered a job at a small consulting practice in my home city, which I gladly took. Almost a year to the day later, a former colleage approached me to join him at another fabricator, this time in North Yorkshire, and there I have remained for the last 8 years. The life of an engineer working for a fabricator is very different to that of a consultant, and as I write this welcome piece, I believe that difference is one of the main topics I want to explore here. It is exciting that public awareness of engineering as a whole is increasing, so I hope that I can contribute to a modest bump in the awareness of my small, and perhaps overlooked field. The first question I must now ask myself is “does anyone care?” followed swiftly by “is this even interesting?”. The answers I give myself are “well yes, I do” and “I truly hope so” respectively. I don’t know who will be keeping score for me, but whoever they may be, I hope they are kind enough to let me down gently if I’m wrong.